I will soon be releasing a start-to-finish retouching tutorial video here at Fstoppers on my most recent fashion editorial photoshoot. 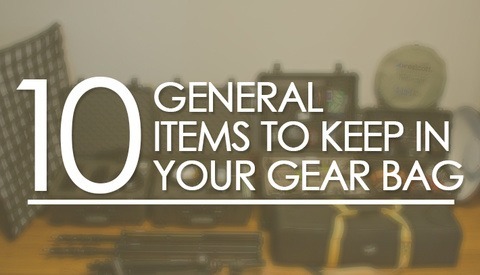 But before I do, I wanted to start warming our readers up with a complete gear list. In this article, I share with you everything I used on my shoot, the breakdown of costs, and where to find all the gear and extras: from the Profoto Strobe all the way down to the gaffer tape. There are so many elements that go into a photoshoot, whether it's shooting on-location or in-studio, every detail must be paid attention to. Hopefully this list is helpful and shares some insight to the planning of your next editorial fashion shoot. The Profoto strobes are the most expensive item here, by a mile. I used the 1000 w/s heads. Other similar strobes like the Elinchrom Pro HD 1000 are great as well, that particular model is approximately $400 less than the Profoto. Both the Photek and Apollo softboxes are indirect lighting sources, meaning the light bounces into the back of the box and back out the front for an even light source. The fill cards are very simple items. I used 4' by 8' foam core boards. I tape two together to create a V-Flat that can stand on its own. I highly recommend spending the extra $100 per strobe and investing in c-stands over regular light stands. When you are spending $1,000 plus on each strobe I just think that the extra $100 to ensure your light doesn't take a tumble. The Mini boom is used on the main light to help angle and position it with more control. There are a number of different ways to hang a backdrop, but the Backdrop Alley studio kit is a great mobile option. For the backdrop seamless paper, we went with a wider role, since we are shooting full length and movement for the editorial the wider 9 foot role was the way to go. You also have to remember to pack all the little things like gaffer tape. No tape, no shoot... or at least you will have to get very creative. The D800 is my current camera of choice. The link here is actually to the newer D810 from Nikon. They are both amazing cameras, boasting a more than 36 megapixel sensor and a very impressive dynamic range. I usually try to shoot with longer focal lengths. The studio we shot in made it a little bit of a challenge. Shooting full length and capturing jumping and hair flipping meant needing to shoot a little bit wider. I was also very mindful of how wide I was shooting, staying between 50 and 70mm. But the 24-70mm and the 70-200mm lenses from Nikon are great. In studio they allow to shoot at a smaller Aperture, like f/11 or f/16 and still get great results. Tethering is not a necessary thing, but I'm a big proponent of it, whenever it is possible. Being able to have a large screen that everyone can see (model, MUA, editor, etc) is a huge advantage. Being able to create presets for your images is also an added bonus. Also, the security of knowing your files are already on your computer's hard drive is pretty nice. I still recommend having a SD or CF card in your camera while tethering. The cord can easily come out or Lightroom can crash; having the card in the camera means you have a backup source for your files to go to. I have had the personal experience of taking an amazing run of shots from a model, only to turn back to my computer and see I didn't get any of them. The SD card can save you that headache. I am very confident that there are small odds and ends that I am leaving off of here. With so many little and necessary items to have on set, it's inevitable that I'll leave something off. Part of this shoot was having movement throughout, so having a fan that can create movement in the hair was a must. The Blow-It fan is a great option that won't kill your wallet. Also being able to fire your strobes remotely is an absolute requisite here. I like the Pocket Wizard Plus IIIs but I also really like the Phottix Stratos triggers. This shoot in particular I used the Profoto Airy Sync, it allows you to change your power output on each strobe, which is a huge plus. If you wanted more control over your background, you could easily add 4 more lights, 2 on either side to evenly light the background. I would recommend reading my how to easily light a white backdrop post. 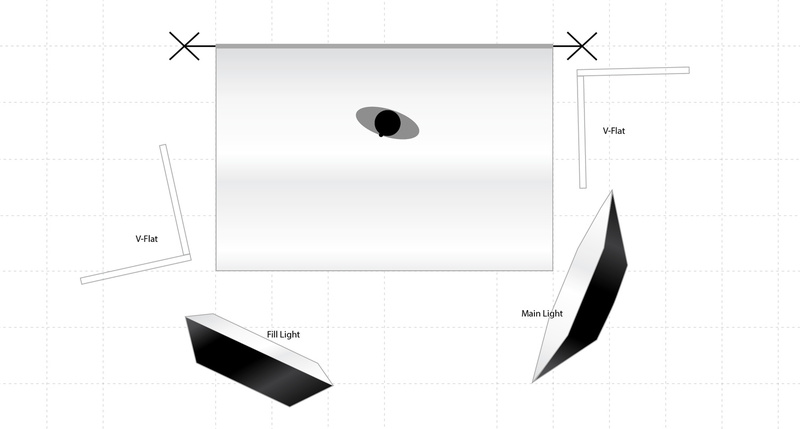 In that post I light the backdrop in a similar fashion, but also write on how you can use two lights on either side to create a nice evenly lit backdrop. I also would recommend making two additional v-flats - each one going around your backdrop lights so you don't get uncontrolled spill from those lights onto your model. When using lights to light-up your background, it is easy to wind up with the "glowing halo "look on your subject. All of the extra light is bouncing off of your background and onto your subject and it doesn't look good. You can stop this by getting the proper exposure and amount of light on your background but also by placing V-Flats around your background lights to block that light from bouncing back. I want to finish up by saying that this is my list of gear that I used on this one shoot. Its not the "end all, be all," or the list of gear that you need to shoot an editorial. There is quite possibly an infinite number of ways to shoot an editorial. I hope you guys found this list helpful and insightful. My culling and editing video will be out next week, so be on the look out for that! All feedback, questions, suggestions, etc. are always welcome below in the comments! Why is everything photography related priced like surgical equipment..